This post is sponsored by Kuhn Rikon. All opinions expressed are my own. Thank you so much for supporting the companies that keep this blog going. 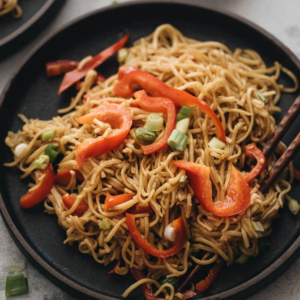 If you need to fix a quick dinner in 15 minutes, this easy garlic noodle recipe might be your best choice. Simply start a pot of boiling water to cook the noodles while you prepare the ingredients. Then mix everything together in the hot pan, and you’ll have a restaurant-style Chinese takeout dinner in no time! 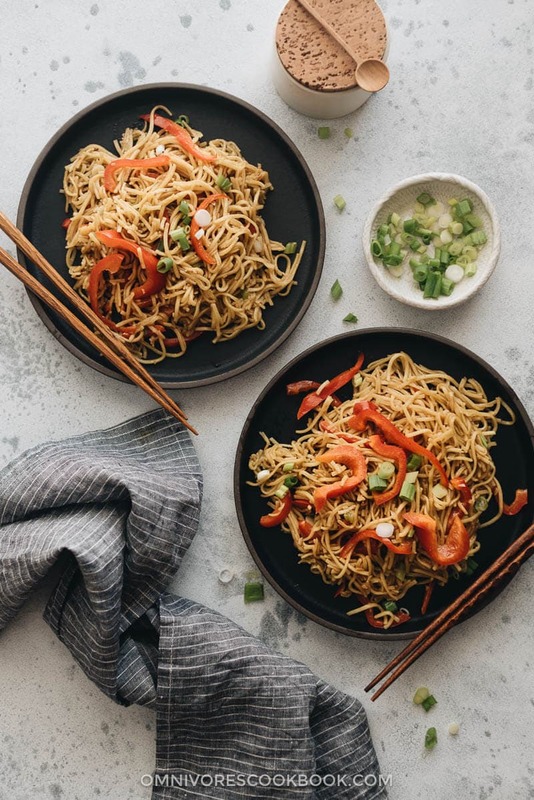 The noodles are lightly charred in a hot wok, infused with tons of green onion, and ginger and garlic flavor, then quickly tossed with a slightly sweet, savory Asian sauce. I usually add a handful of sliced peppers to the dish to add color, texture, and nutrition. But you can replace them with other vegetables or skip them altogether. You’ll be surprised how smoky and flavorful the noodles are, cooked with so few ingredients. In the past I have talked about the challenge of cooking stir fry on an electric stove. 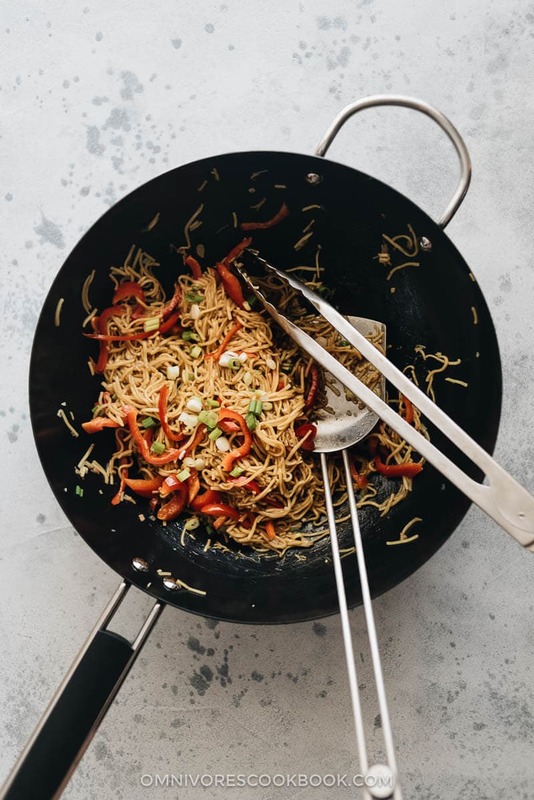 Despite the fact that I’ve been trying to create most of my stir fry recipes using a nonstick skillet, there are a few dishes that I would always prefer to make in a wok. They are: fried rice, simple fried noodles, and stir fried vegetables. These dishes have something in common – they all use very few ingredients and are not cooked in a lot of sauce. In this case, the wok cooking will truly show its advantages. 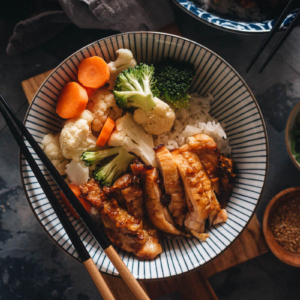 The primary advantage is the hot air (or wok hei) that is generated during the stir fry process, which imparts a smoky taste to the dish, making it extra rich and fragrant. Luckily, I recently found the perfect wok to use on my electric stove. The Kuhn Rikon Covered Wok Skillet (US$70) is a lightweight iron-constructed wok that has a flat bottom. It heats up fast, even on an electric stove, and it holds heat well. The best part is, it creates that heavenly char on fried noodles in a few seconds, along with that amazing smokiness. 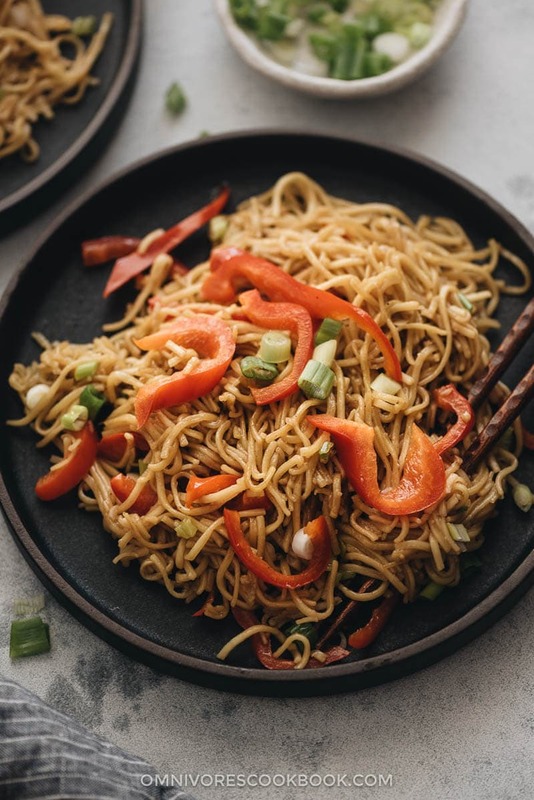 To make fried noodles without making a big mess, I highly recommend using the Kuhn Rikon Wok Spatula (US$18) and a pair of Kuhn Rikon Precision Tongs (US$18). I always use a pair of tongs when I cook with noodles. I found that they have a better grip on the noodles and toss the sauce well without spilling food on the stove top. These tongs can lock in the closed position, so they take up very little counter space during cooking and in storage afterwards. A wok spatula is a must for wok cooking, especially for noodle dishes, to release the noodles from the hot pan. Because noodles are highly starchy. 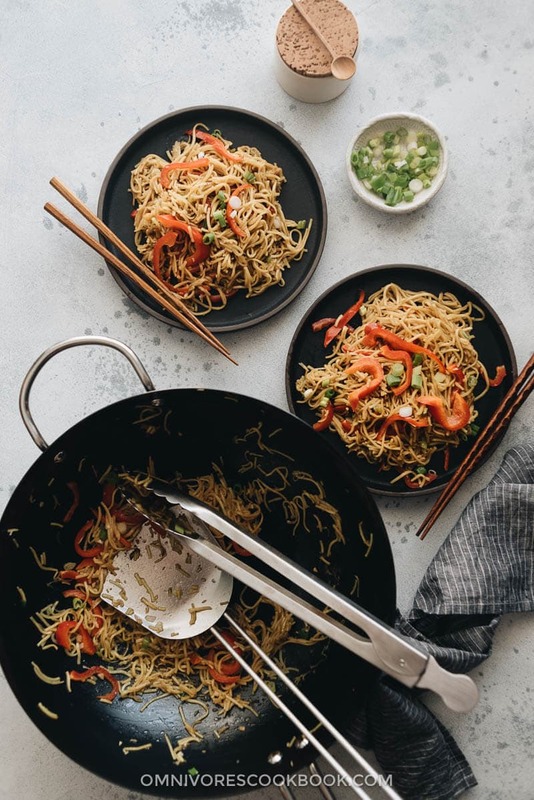 Even though your wok is quite nonstick once you season it, some of the noodle pieces might still stick to the bottom if you leave them there too long. A wok spatula has sharp edge that can release the food from the hot pan with a simple scoop. The garlic noodles can be served as a main dish for lunch or a light dinner. Or you can serve them on the side of a protein. Instead of the bell peppers, you can use some sliced onion, spinach, or blanched broccoli. No matter what you have on hand. You can make the garlic noodles in a nonstick skillet, too. 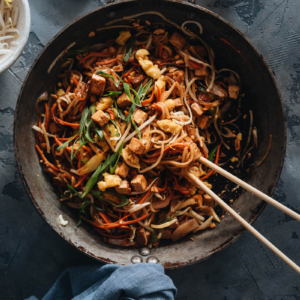 However, once you try wok cooking, you’ll discover the magic of wok hei and won’t want to go back! Combine all the sauce ingredients in a small bowl and mix well. Boil the noodles according to the package instructions until al-dente. Rinse with running tap water to stop cooking. Drain and set aside. Heat 3 tablespoons oil in a wok or nonstick skillet over high heat until hot. Swirl to coat the bottom of the pan with oil. Add the noodles. Toss with a pair of tongs until the edges are lightly charred. 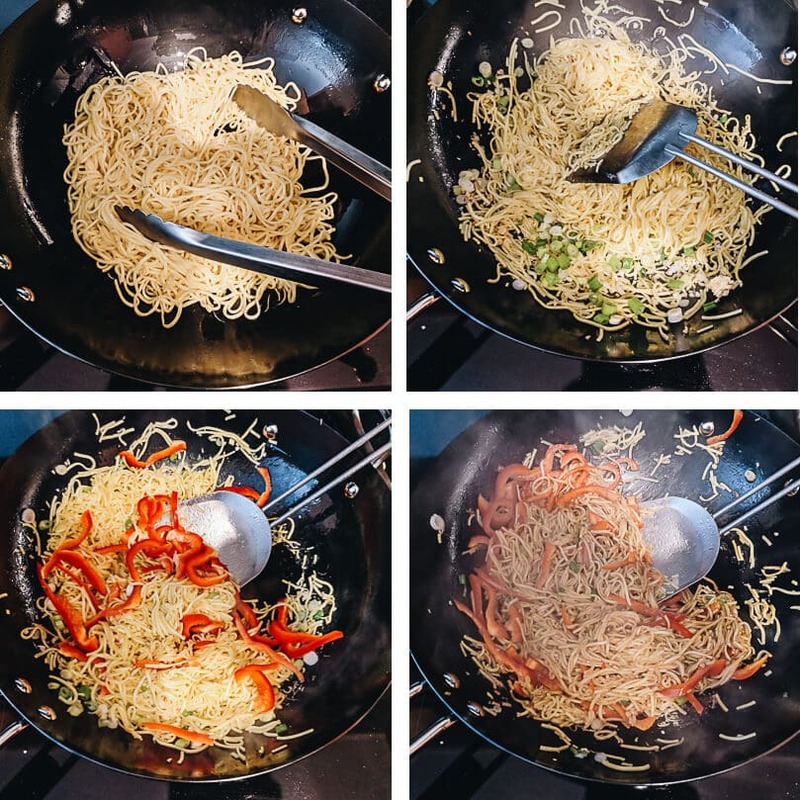 Add a bit more oil and use a wok spatula to scoop to loosen the noodles if the noodles stuck to the pan. Add the white part of the green onions, along with the garlic and ginger. Cook and stir for a few seconds to release the fragrance. (Optional) Add the bell pepper. Cook and stir for a minute or so, until the pepper just starts to turn tender. Pour in the sauce. Quickly toss the noodles until the sauce is absorbed. Add the green part of the green onions. Transfer the noodles to serving plates. Serve hot as a main or side. To make the dish vegetarian, use homemade vegetarian oyster sauce instead of regular oyster sauce. To make the dish gluten-free, use rice noodles instead of wheat noodles, dry sherry instead of Shaoxing wine, homemade vegetarian oyster sauce instead of oyster sauce, and tamari or coconut amino instead of soy sauce. You can also use lo mein noodles, udon noodles, or wide wheat noodles to cook this dish. I can’t wait to try these. I love noodles. I need a wok soon! 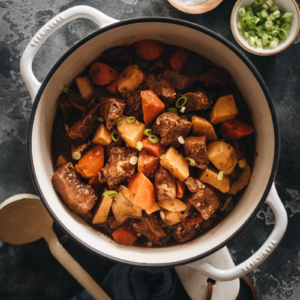 Made this, as well as your chili beef recipe. Excellent. 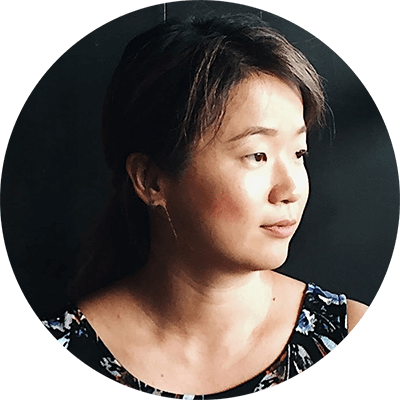 I lived in Singapore and Taipei for 10 years, and traveled China extensively . Your recipes are authentic. Love following your blog. I tried this recipe when I saw it today. I love noodles and veg. I had the same noodles in the pantry, added some of your BBQ pork that I had in the freezer, celery, onion. Basically, your fridge clean out. Tasted great but screwed up on the noodles. Really wanted that take out firmness that I like. Very starchy. I used a wok that I have had for 20 years over gas stove. 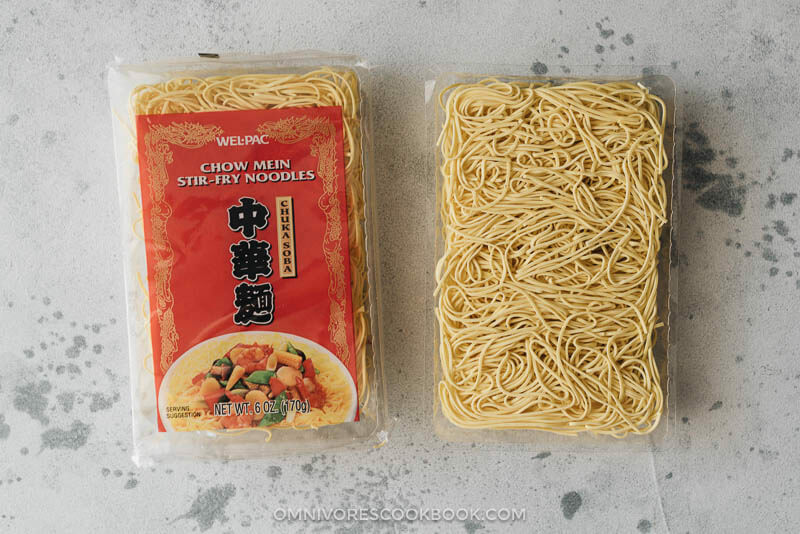 Is there a way or better noodle to get that texture? Thanks for all you do. The restaurants all miss me now that I have you. This is the first recipe I tried and I made it for lunch- totally delicious ! For me it’s just great! Thank for the Kuhn Rikon wok recommendation – does it come pre-seasoned? Hi Sarah, the Kuhn Rikon wok doesn’t come pre-seasoned, but it did include a very detailed instruction. I remember it’s sth like stir fry chopped onion until they are all dried out (15 mins or so if I remembered right). Pretty easy!